The weather is easing up and I’ve seen a few robins out in the backyard which is a sign of good things to come. Some people smell that earthy dog smell that’s uncovered after the snow washes down the gutters but I smell Rawlings, peanuts and beer. “Bottom of the ninth, bases loaded and a full count” or this beauty, “Gettin’ to first base”. We all know these sayings and I bet you can walk down King St. and the majority of people would know exactly what you’re talking about. It’s a beautiful game. Not only what happens on the field but off the field. There’s the scoreboard–every statistic tells a story from an RBI to a stolen base, you can pick up exactly what happened at what time throughout the game. No other game can tell a story like baseball. Off the the field there’s the chatter. Every fan has a tale to tell on what brought them to the game. Don’t believe me? When the Chicago Cubs won the World Series after a 108 year drought, it affected so many people’s lives and not just because of the drought being over, it was the fans that were affected. Generations who never saw them win a championship were remembered at grave sites, arm patches and photographs. That’s what baseball does to a nation, or the Chicago Cubs. —Terrance Mann, Field of Dreams. Even with the digitization of America, there’s something about the game that peels back the skins of time and reveals its heartbeat, our childhood, our innocence and our love of all that was good in its most simplistic form. It’s in the sounds of the game from the pop of the bat to that heckler in the stands the best and the worst of who we are. It’s in the smells of the turf, the beer and the hotdogs. Seeing the score board and reading the game and one of my favourites, the taste. Hot roasted peanuts and hot dogs. Baseball makes a lot of sense. This #HappyAct is a little project that will take you into the summer, and hopefully if the stars align, the autumn. Go see a baseball game. There’s many to choose from The Blue Jays, The Chiefs or the Ottawa Champions. If you’re feeling ambitious, take a trip and make a pilgrimage to Cooperstown or one of baseball’s greatest parks. Go by yourself or best yet, bring the family. For more Cubs action, visit Mark’s blog, canuckcubbie.com. 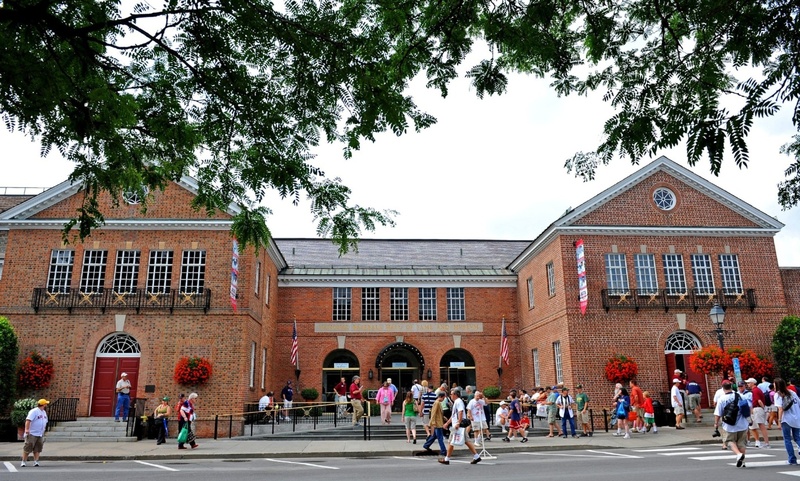 Main entrance of the National Baseball Hall of Fame in Cooperstown, New York. It seems that every summer, the familiar itch returns. No, not the itch from mosquito bites or sunburn. I’m talking about the itch I feel for a road trip to visit Cooperstown, New York. Cooperstown is the home of the National Baseball Hall of Fame, and not surprisingly, my love of the area is rooted in a deep passion of the sport. The Montreal Expos were my team growing up. 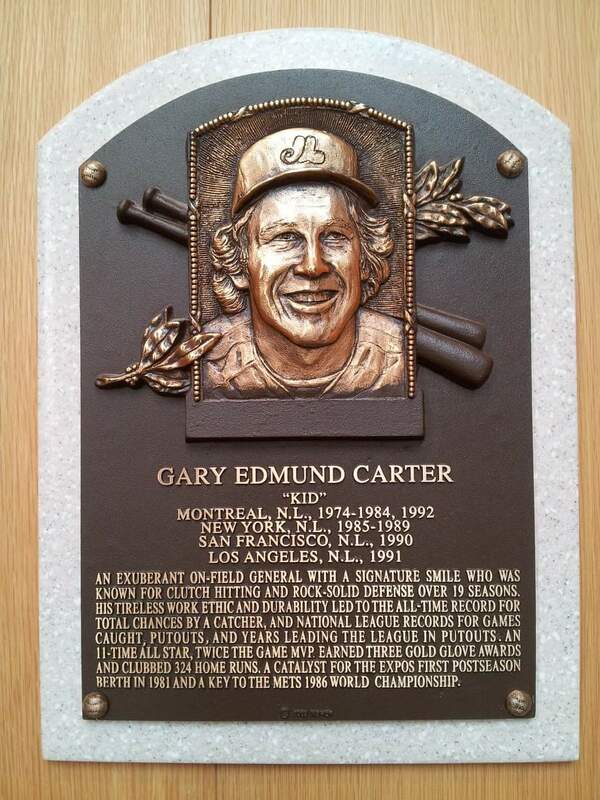 My baseball heroes included the likes of Tim Raines, Andre Dawson, Steve Rogers, Ellis Valentine, and my all-time favourite, the late, great, Gary Carter. I still ache from that dreadful day in 1981, when the Dodgers’ Rick Monday smacked a late homerun abruptly torpedoing the Expos’ playoff drive. Fortunately, Cooperstown is only about a three-hour trip from where I live. A relaxing, scenic drive through rural Upstate New York towards Otsego Lake. Entering Cooperstown, you get the feeling that you’ve been vaulted into the past, especially in the neighbourhoods nearest the Hall of Fame. Majestic older homes line the streets. American flags hang proudly everywhere. In my many visits, it seems that the town had never changed, and that in itself might help explain part of the allure. When everything around us seems to be spinning off its axis, it’s comforting to have an escape destination seemingly frozen in time. 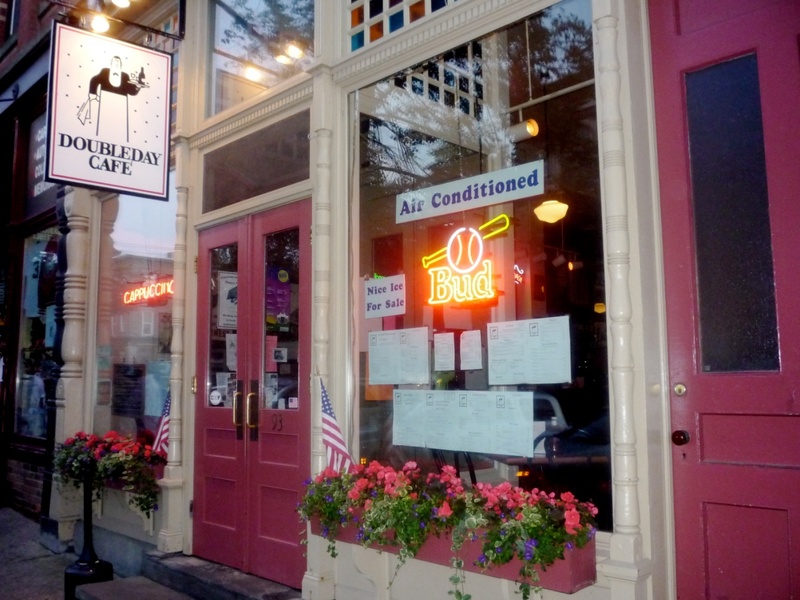 Main Street alone is worth the trip to Cooperstown. A genuine feast for the senses, as they say. 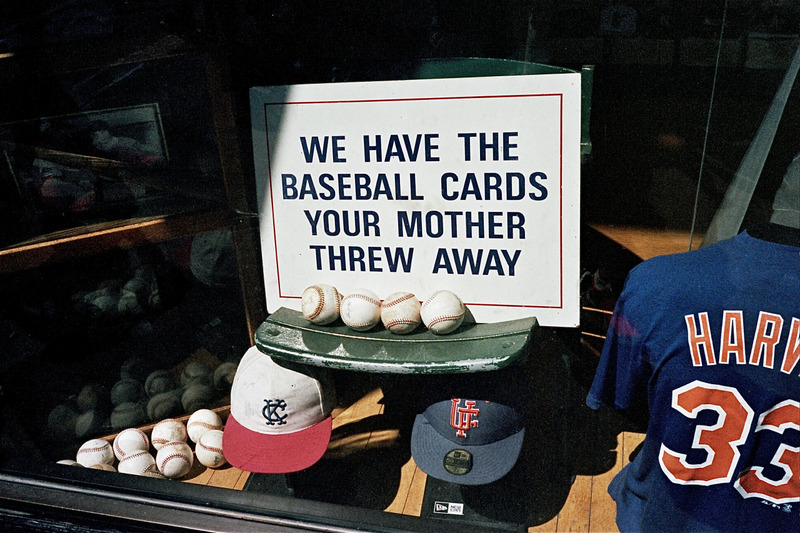 The sight of so many baseball-themed storefronts, the smell of fresh popcorn, and the sound of organ music from stadiums long since demolished. The sidewalks are typically filled with bright, smiling faces, especially families. One generation passing-on their love of the game to the next. So many hats to choose from at Mickey’s Place. So many old, creaky-floored collectible shops to get lost in, each brimming with treasures from days gone by. How I’ve been tempted at times to take a piece of history home with me. If only my wallet would cooperate. 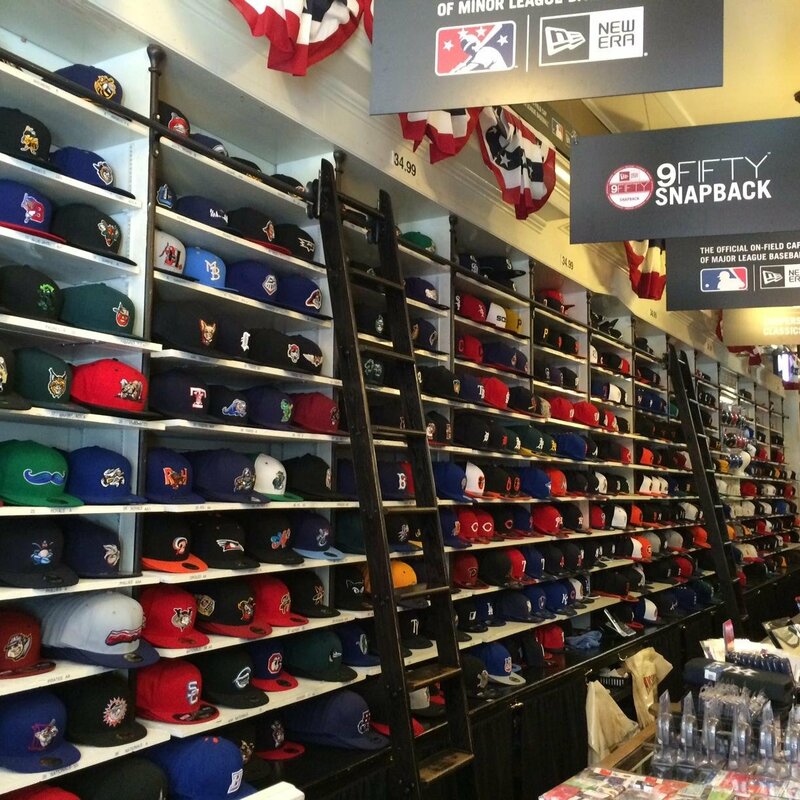 If your preference is for something more present-day, you won’t have to look far to discover row upon row of baseball caps, balls, jerseys and t-shirts. And then of course is the Baseball Hall of Fame itself. A shrine to the game’s history and players. Whenever I visit the Hall, I always feel surrounded by ghosts, the deceased greats of the game, watching along-side as I enjoy the exhibits. A few years ago, I had the opportunity to tour the Hall outside of normal business hours. I remember visiting the room dedicated to fabled Yankees slugger, Babe Ruth. His bats, trophies, and even locker from the old Yankee Stadium on display. It was eerie enough being alone, but I’m sure I could feel his presence there with me. This week’s #HappyAct is to visit Cooperstown, New York. Certainly a paradise for any baseball-enthusiast, but also a relaxing sojourn back in time that everyone will enjoy. Ray is a mostly harmless goofball who lives in Mallorytown, Ontario with his canine sidekick Abby. Visit Ray’s blog at www.storiesfromdoreyville.wordpress.com. Ed. note: Thanks Ray for this great guest post. I’m sad to admit I haven’t visited Cooperstown yet–it’s now on my list!